The most snap resistant cylinder lock now available at Bradleys. The first thing you want from a door is to keep the bad guys out. Rather than rely upon badges and star accreditation’s influenced by lock manufacturers and carried out in test centres these films show you a real life door, on a real life home, with an increasingly real life entry method. 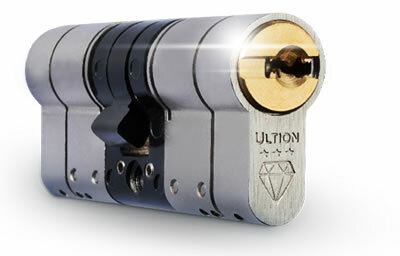 The ultion lock features Lock Down Mode. The moment that Ultion detects forced entry it activates an attack lock directly into the central cam, this is ‘Lockdown Mode’. Even if the most determined intruder gets past Ultion’s two sacrificial sections he won’t get to the attack lock because it is protected deep inside a solid molybdenum core and secured with a dedicated retaining pin. When Ultion is in Lockdown Mode your home and family are safe.